To say I am unhappy does not describe the depth of my duress and disgust with this product!!! Does NOT come with the required- and NOT AVAILABLE LOCALLY - Micro HDMI to HDMI cord for viewing!!! Must order cord online from outside source. Stupid to require- and not provide that cord- while coming with more mounts that one could ever use. How do you think that works out when using various mounting points on the bike? Not at all suitable for Trip of a Lifetime on the bike leaving in 2 days, or for everyday use. Still images are lower res than my cell phone! Nice way to create motion sickness for viewers as you look thru a turn, after turn going thru the Sierra Mountains! If it had that, or a coming actual date of release, everything would be ok. The regular Prism and Tube version dont even have the same specs! Epic fail on SENA for not having the firmware done. I spent a long time waiting as it updated firmware right out of the box. Also needs micro SD card to even turn it on, but why bother- cant see what you record anyway. This camara is very cool. The recording is extremely clear . The audio is very sensitive, it picks up everything. And Sena is developing a camera app for this camera so you can get instant visual on your phone. Can't wait for that. It will make this great camera even greater. It’s a good camera, Sena should fix the firmware so you can preview the shot on your linked phone through the app before setting off on a ride. The battery like all small action camera six so you’ll need a solution to that, power bank or spares. The biggest gripe is the mount which is excellent except that the release tab for the camera is easily broken and you cannot buy parts for it. You can only purchase the entire helmet mounting kit again and again. This isn’t cheap and the part is a weak point so should be available for replacement. I wouldn’t buy this camera for this reason alone. Go for something with a supplier that backs their product with customer support and parts. Neither of which Sena can do it seems. gopro or get something else. I still had the sena backpack and all the Gopro mounts but this package was cheaper than the Gopro and comes with lots of mounts and a water proof case so I bought this instead. I like its size and profile. The way it mounts to the side of the helmet is good. It works really well with my Sean blue tooth head set. I like the way it automatically mutes the external mike of the camera when you are connected to the headset. The App for your phone works really well for changing settings on the camera. It records your voice really well without any wind noise but manages to pick up the sound of the bikes exhaust note just enough. Love the compact size. Paired with the 20s. Great sound and video. No issues thus far. Getting a solid two hours and change from the battery. Great cam for the money. Very happy. Camera works. It's not easy to open. One of the rubber plugs broke as soon as I grabbed it. Otherwise I love the camera. Pretty tough little guy right here. Great camera for what I need it for. Has all the features that I need plus more. The best bonus is all the mounts that come with it, including a teather. BEST $155 I have spent! I'm a fan of every feature that comes with the camera, from the multiple mounting structures (which I have used a lot of), to the real time audio recording. I think the videos produced are of good quality, and the settings on the device are easily navigated. The one bad thing about this device is its battery life. I can only record ~2hrs at 1080p, which is just too little in my opinion. Yes, you can buy extra battery packs or charge as you go, but that's just a band aid to the actual problem. Changing the frame rate/video quality doesn't gain you that much in longevity either. I would recommend this to someone else with the caveat that it's not a great device for just the average joe user. I think it would really excel if you were vlogging, but for just standard recording it is overpriced for the amount of recording time permitted on one charge. Nice BlueTooth camera that comes complete with all possible mounting hardware. Easy to install and use. Excellent when paired with Sena 20S headset! The Sena alternative to the Go Pro! Side by side comparison keeps the Go Pro 3 Silver at bay, but for my purposes that is all I needed! I like the side mounted action cameras and GoPros were too wide profile for me. The bluetooth audio recording is helpful when recording reviews with a regular bluetooth headset. This is my first camera to film my cross country trips. I did a lot of research on line and talked to one of the reps at revzilla, sense I already had a sena blue tooth, I can talk on the video when I want to. Price and Bluetooth integration with my Sena 10U headset. I picked this product for its Bluetooth integration/wireless properties. While not a one-stop solution, the Prism unit offers versatility that other Sena imaging products don't presently possess. Want to start moto-vlogging and this looks like a great camera to start with. Love my other sena devices and this will get rid of alot of cables. fully integrates audio from my sena headset..
Sena products are really good, I'm not a fan of gopros even tho I have two. Sena bluetooth can't be beat. Price, mounts, audio make these a really smart investment. We have the Sena 20s and this integrates well. It also catches less wind than the go-pro. The video is almost as good and the audio is much better. What a Kit it is worth it, there is no wires dangling and it works with My SMH 10.
i have used in torrential rain and it was frozen, after one day of normal drying it started work again. I wanted an action cam that didn't require me to run another microphone through my helmet. Had good reviews, like the camera features, videos posted online showed really good quality, like the size & styling, and camera comes with a lot of different mounts. Light weight, slim profile, ability to mount on side of helmet, comprehensive mounting options, quality of images. I have a Sena 20s system and it is simply outstanding,,,,no reason not to think this would be the same. Many reviews exist that rate it very high with excellent sound quality. bluetooth control and voice recording, plus what looks like awesome mounting options right in the box. 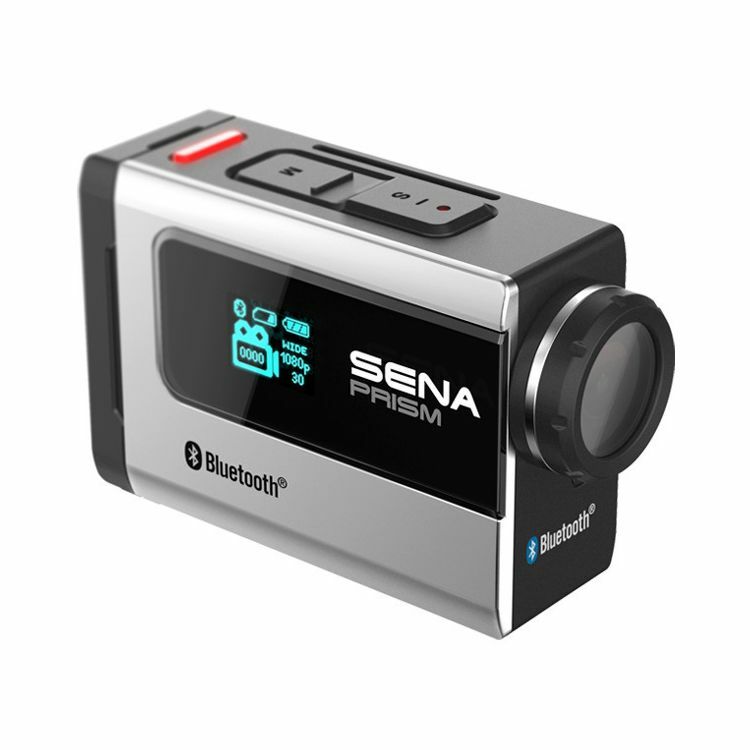 Will this camera be compatible with previous Sena Bluetooth 3.0 headsets, such as the SMH10, for voice control operation of the camera and If so, will the previous model headsets contain the exact same functionality as that of the new Sena 20S system which utilizes Bluetooth 4.0 technology? BEST ANSWER: Yes, to try to clarify: You can use any SENA headset (such as theSMH10) to fully control the camera. But understand that the camera is controlled by button pushes and jog dial operation regardless which headset you use. The Sena Prism is NOT voice-controlled in any configuration. The Prism allows voice *recording* from the headset and it can be controlled from the headset controls (buttons/dials) but it does not operate by voice command. It DOES provide voice prompts to you such as "paused" "recording" but to give it a command such as record or take a picture, you'll have to press the dial,etc. Yes. All Sena headsets, besides the 20S, will be compatible with the Prism but will only be able to control the Prism using the necessary button operations. What does this mean exactly? I have an SMH10. Will I be able to fully control the camera with it? Yes. I am doing it with my SMH10. Can I use the HDMI port to check the camera alignment with a live feed from the camera? Or do I need to record a video, then watch it on a TV or computer? The camera is compatible with Micro SD, SDHC or SDXC cards up to 32 GB. You can swap out memory cards by removing the back door and popping out the memory card from the memory card slot. The recording time is based on the battery life of the Prism as the maximum recording time for a memory card depends on the size of the memory card. what actually comes with this camera? like what mounts and cases, i see a variety of them on the actual sena site but i am not sure which ones actually come with the camera. also my main use for this camera is for riding, but my gf wants to use it say as you would a go pro for our next vacation coming up. Do you think the camera will be fine submerged underwater at depths probably up to 10 ft, and will the camera be fine to operate without having it hooked up to an intercom system but just with using the buttons provided on the actual camera? BEST ANSWER: The Sena Prism comes with a surprising amount of accessories you'd normally have to buy separately when you buy a GoPro (AND THEY COME FOR FREE). It also comes with a rechargeable lithium battery and a USB charger. I would recommend downloading the manual Revzilla provided, because the manual that comes with the produce is an image only sheet, and is not the easiest to figure out. You WILL need to purchase a micro SD card for the camera, but that comes as an obvious. The camera will not sync nor update without one inserted. Everything is shown, and yes, it includes ALL the QRM mounts AND the Helmet mounts AND the underwater box. The Prism is rainproof, they say, for normal riding use withOUT the box, but for diving, snorkeling, the box will be needed. The box is good to 40M of depth. The cam can be used without the intercom. The buttons can do all functions of the camera. For vacation use I would suggest buying extra batteries. Note that there's no external charger, you'll have to use the camera to charge the spare batteries, but each battery will be good for about two hours. a 32GB card for maybe five hours. The waterproof housing seems very well done and according to the box it is waterproof to 40 meters (that's 120 feet). I have not tested this myself but you should be just fine at 10 feet depth. Operating it without the intercom is not as intuitive but still very easy to do thanks to the display on the camera. Just takes a few minutes to get used to navigating the menus via the buttons. The camera comes with all the mounts pictured on Sena's site. There are many options. It comes with a water proof case, though I'm not sure what the submersion rating of it is. The camera is easily useable with its included buttons. Messing with settings can be tedious unless you use the smartphone ap. I usually don't pair it with my intercom (20S), as it disables bluetooth music streaming from the phone when paired. Everything accessory you see on the website comes in the box. Helmet mount, bipod suction cups, flat and curved mounts. It comes with a 40m waterproof case, I would recommend using that when going any more than a few feet. Everything can be accessed by using the two buttons on top much like a go pro. It's comparable with any regular camera/video camera tripod or "selfie stick"
Oh, and as an addition, the packet does include a Waterproof casing that is attachable to a mounts. It seems more water resistant than it does proof, but the case seals completely shut when the camera is inserted. Use your judgment when you get it, though. What is the actual battery time recording 1080 video? Does it have a removable battery so it can be swapped out? BEST ANSWER: Battery time without Bluetooth connection was about 2hrs 30 min. With Bluetooth connected it was about 2 hrs. Yes. it has a removable battery so it can be swapped out. removable battery yes, and it can be charged while in use easily through rain proof usb port. it depends on what quality you record at. On my Sony I used to record at 720p to maximize my card space. The test I did with the prism was 1080p. I recorded 19 minutes and 20 seconds and that took 1.87gb. So my rough math is that a 32gb card will get you 5.25 hours at 1080p. Using a 32GB card, you can record up to 4 hours and 48 minutes at 1080P. Does this camera have an automatic overwriting feature? In other words, will it delete the oldest video(s) when it starts to run out of space on the SD card? I would like to use this as a dash cam, but I don't want to have to manually delete videos before every ride. Thanks! BEST ANSWER: No it does not but Sena is looking into the possibility of adding that feature. great question ! i was wondering the same thing. What format does it record in, and what video editing software can be used to edit files on a Mac? Does it come with a mic? BEST ANSWER: The Sena Prism has a built-in microphone to capture ambient noise. It is also BlueTooth capable, which allows capturing your real-time commentary if you have a BlueTooth communications system such as the Sena 20S attached to your helmet. The Prism with a 20S, or any BlutTooth capable communications system, will be the complete package. It comes with an internal Mic! You would have to purchase a Mic, Or like me! I have a Sena 20s bluetooth backpack that comes with a mic so I just linked it to through bluetooth. It has a built-in microphone! How "water resistant" is it out of the box without the water proof housing? Has anyone been riding their prism in all-weather conditions without the WP housing? How is it fairing against weather? I live in seattle and ride all-weather year-round, so "water resistant" is not enough information to tell if it would survive sitting on the side of my helmet while going 70mph in the rain. I have found some IP66 products don't survive the all-weather ride. IP67 and up do. I am wondering if sena even does IP testing given they don't seem to publish or tout IP ratings, (and that would be a feature to use in terms of marketability and feature bullet points,) and for a product that will live on the outside of a helmet that will be used outside, presumably in different kinds of weather including rain, that is profoundly stupid. BEST ANSWER: The silly thing is amazingly unfazed by rain. I have two of them mounted on the bike, not behind the fairing. They are NOT in the WP housings and to make it "worse" they don't even have their "backs" in place. The rear cover covers up the back of the cam, hiding the battery, TF card and the HDMI port, but is slotted to allow charging. This, however requires that you use the supplied cable as the cable's tip is extended to be able to reach through the back. I was not using the supplied cables but some longer standard cables, so the backs are off to allow charging with them. I have thousands of miles on them this way. During a recent trip I got caught in a deluge that had Interstate traffic down to 20MPH and it lasted half an hour. I did not have the cams recording (unfortunately) as my cards were full, but they were powered the whole time. I didn't even think about the iPhone in it's Ram mount and it failed due to water about five minutes into the storm. The cameras were completely operational throughout. As soon as I put in fresh cards, they carried on, unhurt. The poor iPhone had to spend two days in a rice bag. I have probably 10,000 miles with these on my Ultra; I do long rides often; rain never alters my riding and the waterproof cases have never been used. I've had a couple of minor complaints (rolling shutter, lack of a charger) but not rain issues. Yes, the Prism is certainly waterproof enough for riding in the rain. Haven't tested its rain proof ness yet. Back cover & charge port seal reasonably well. Rest of the camera looks water resistant, only issue is microphone port beside lens may or may not be water resistant. If I was riding in anything but light intermittent rain I would always use waterproof case. Electronics & water don't mix well. Will this work with an smh10r? If I am connected to another sena having an intercom conversation can I still record and if I can will it record both voices or just mine? BEST ANSWER: I have a SENA 20S. I believe mine will record the intercom and group intercom audio. Check your smh 10r manual. It should address the priority protocol and capability. If you don't have a manual go to the SENA website and read it there. Yes you can still record and as long as the Prism is paired to your intercom it will record both voices.